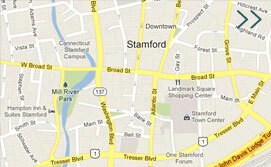 Traffic Advisory | Stamford Downtown - This is the place! 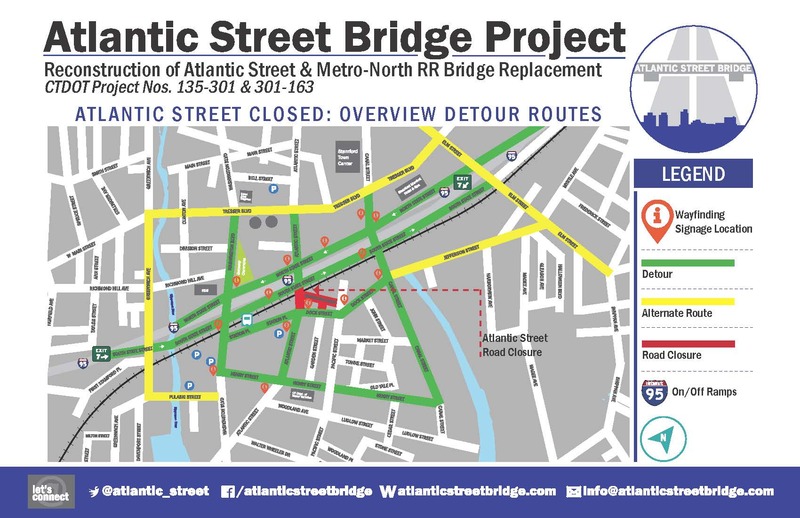 The reconstruction of the Atlantic Street Bridge will result in the closure of Atlantic Street, between the south side of South State Street and Dock Street under the Metro North Railroad Bridge, beginning later this month on Feb. 19. 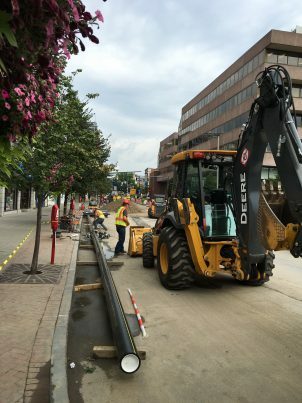 The road will remain closed for the entirety of the project, which is anticipated to be completed in September later this year. 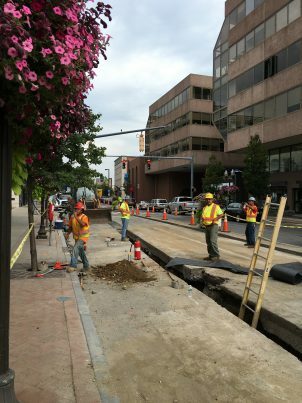 This portion of Atlantic Street will be closed to allow for the installation of a center pier underneath the bridge. The center pier makes it impossible for vehicle traffic to pass through Atlantic Street as it’s being installed, however, pedestrians will still have access. 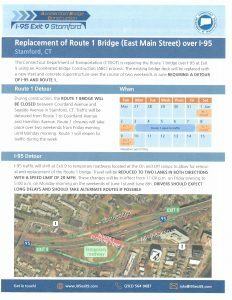 Once installed, the center pier will support the new bridge and Atlantic Street will be widened to allow for three lanes of traffic northbound and three lanes of traffic southbound. 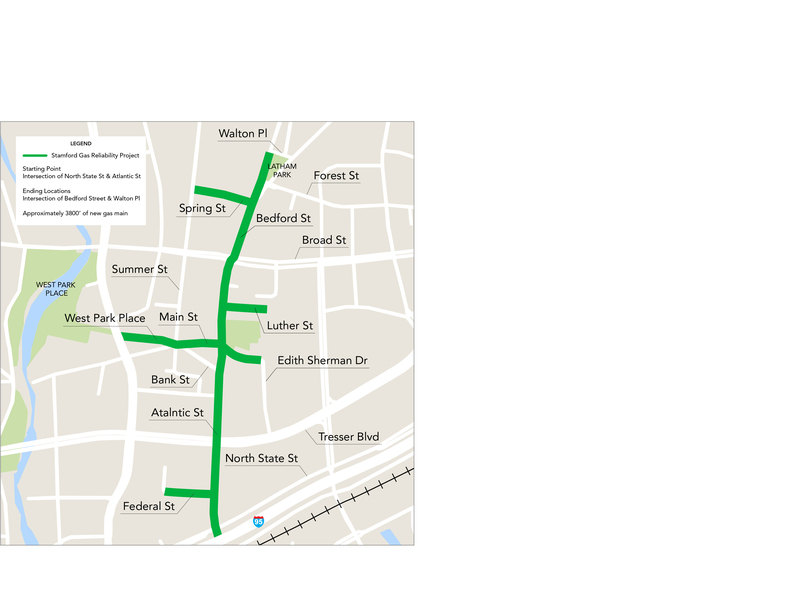 While Atlantic Street is closed, motorists are encouraged to seek alternative routes avoiding Atlantic Street, or using listed detours (photo below). 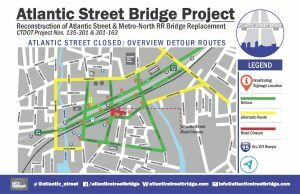 Signage will be placed on the connecting roads to indicate Atlantic Street’s closure. 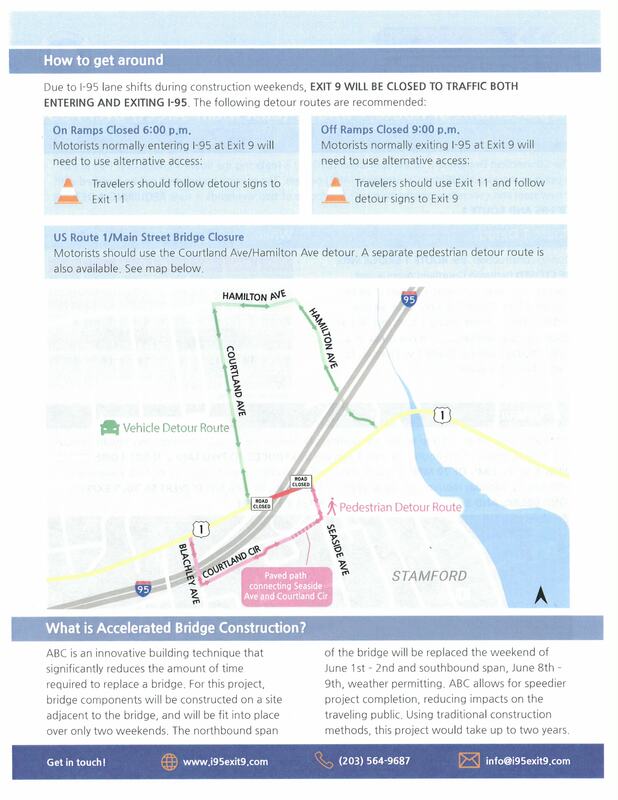 The new Atlantic Street Bridge will be constructed off-site and rolled into place in early July. The new bridge will be wider and allow for an additional train track dedicated for local train service, as well as a commuter platform and egress stairs. Inquiries specific to the Atlantic Street Metro North Railroad Bridge Replacement project can be directed to: info@atlanticstreetbridge.com. Residents can find more information, including a project timeline and additional photos, at http://atlanticstreetbridge.com. Construction activities are temporarily suspended until October 2018. Eversource is working with city officials and anticipates resuming construction once work dates and resources have been secured. Weekly construction reports will resume at that time. Eversource remains committed to providing reliable service as well as accurate and timely information. 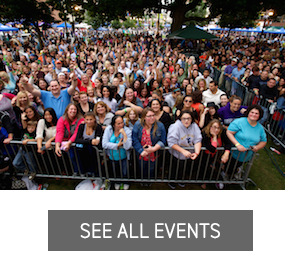 Keeping the lines of communication open is an important part of our work in your community. Progress on Atlantic Street. Note the size of the gas main.